Mrs R is a 79-year-old woman who was transferred by ambulance to hospital from her residential aged care facility after fracturing her left inferior pubic ramus (pelvis). This injury was the result of a fall onto the floor while she was rushing to the toilet. The orthopaedic team admitted Mrs R from the emergency department and because the fracture was stable they decided that she would be allowed to walk and weight bear as pain permitted. From the outset, nursing staff implemented standard strategies for fall prevention and because she was admitted as the result of a fall they proceeded to undertake a fall-risk assessment rather than a less detailed fall-risk screen. Does not like to venture outdoors and receives no direct sunlight. In addition to the standard strategies and in response to the risk assessment, targeted, individualised interventions were implemented to attempt to reduce Mrs R’s risk of falling. Over 65 years of age. History of three falls These are non-modifiable risk factors; however they identify from the outset that Mrs R is at high risk of further falls. Observation and surveillance may be relevant. Hip protectors may be indicated. Four or more medications, including a sedative Pharmacist to review all medications in conjunction with the medical team. If appropriate, aim to gradually eliminate psychotropic medications. Work with Mrs R to explore means of improving sleep without pharmacological assistance. Limited mobility as indicated by the ‘Timed up and go’ test (TUG) Physiotherapist to assess mobility and provide a progressive individualised program incorporating lower limb strengthening and standing balance training within pain limits. Practice safe transfers between bed, chairs and toilet and issue an appropriate walking aid and instruct in its use. 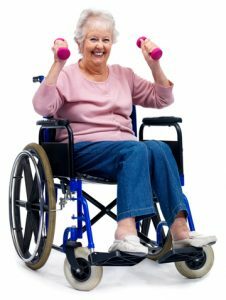 Arrange for ongoing therapy and supervision of an exercise program after discharge. Also, arrange for nursing staff to supervise and reinforce the use of the walking aid. Urge urinary incontinence and nocturia Continence advisor to review and assess causes of the problem. Pelvic floor exercises instigated for urge urinary incontinence. A range of practical solutions, including provision of a commode at night time and wearing of incontinence pads should also be implemented. If relevant and appropriate, alternatives to diuretics may be considered. Low Mini Mental State Examination (MMSE) score Medical staff to investigate the cause of low MMSE, and treat any identified reversible causes. Refer Mrs R to occupational therapist or another professional with the relevant training for assessment of cognitive state and advise appropriate cognitive interventions. Develop care plan based on Mrs R’s usual routine/ schedule. Ensure regular observation and surveillance, particularly during Activities of Daily Living (ADL). Encourage the supply and use of familiar personal items whilst in hospital. Foot pain limiting mobility Refer Mrs R to podiatrist for assessment of foot pain and interventions to minimise impact. Ensure footwear is safe. Use of bi-focal glasses for walking Ensure use of single-lens glasses when walking. No sunlight exposure Measure vitamin D levels through blood 25 OHD3 and supplement accordingly. Arrange 5-55 minutes unprotected (i.e. without sun screen) exposure of face and upper limbs to sunlight 4-6 times per week before 10am or after 3pm. Osteoporosis risk factor: low-trauma fracture Bone densitometry and appropriate osteoporosis therapy. Consider prescription of hip protector pads if compliance is expected. The condition of Mrs R’s muscles and bones is optimised. The health care teams at both the hospital and residential aged care facility were all made aware of changes to Mrs R’s care through chart entries, case conferences and appropriate discharge correspondence. Mrs R and her family are made aware of the changes to her care through a scheduled meeting with the health care team. This case study has been copied from the “Preventing falls and harm from falls in older people: Best practice guidelines for Australian hospitals and residential aged care facilities” 2005, Australian Council for Safety and Quality in Health Care, copyright Commonwealth of Australia reproduced by permission.